EQUIPMENT: I know how important it is to stay in touch with your family and friends or to have access to internet for work any time of the day. Therefore, there is a high-speed internet connection (wifi / cable) also, there are about 130 TV channels, CNN, HBO, AXN, ... The apartment is fully equipped. - Hair Dryer - Shampoo & Conditioner - Coffee Maker - Electric Kettle - Several types of tea (Earl Grey, Lipton, Green Tea & Fruit Tea) - Instant Coffee, several types of coffee - Sugar, Salt & Pepper - Umbrella - Iron and Ironing Board - Toilet Paper and Paper Towel - Washer - Extra bed linens (Pillow Cases, Bed Sheets & Comforter Cover) - Clean towels (Each guest will receive 1 set of bath and hand towel. If a guest is staying longer than 5 nights, he/she will be provided with a new towel set every 5th night) The apartment has a fully-fitted kitchen (oven, microwave, fridge, utensils, etc. ), separate toilet, separate closet (wardrobe) and the following amenities: Feel free to help yourself with what's available in the kitchen. Some items may vary from time to time. If you replenish what you consume, it is appreciated but if you don't, it is fine. CLEANLINESS: Cleanliness is my nr. 1 priority, therefore, we clean pillows, blankets but even mattresses and sofas regularly with a water-cleaning method. Upon request, I provide anti-allergic pillows for people sensitive to feathers. House maid and cleaning upon request. We always meet our guests in person and are more than happy to share information about Prague landmarks, restaurants, cafés, clubs and bars and our favorite places. Whether you are coming to Prague from the airport or from the train station, the location is just perfect. I included the directions below. 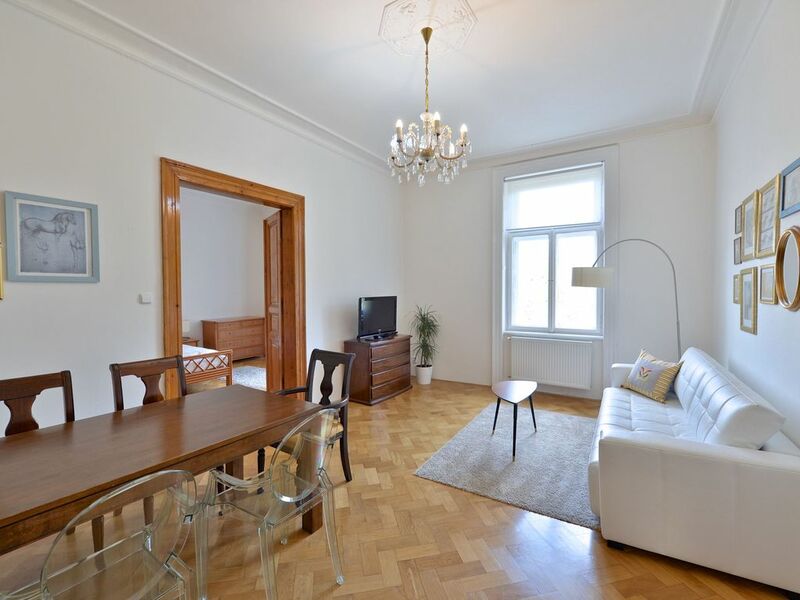 This apartment is located just in the middle of the historical Royal Vinohrady area. This is the most wanted area in Prague, best know for it`s famous residents. There are many painters and writers, who live permanently nearby - they have often been inspired by events and conversations taking place in the park next to my apartment and immortalized the park in their fiction. Vinohrady is very popular because this historical area doesn`t get as much noise as Wenceslas' Square and other noisy locations, yet, it is an area of the best restaurants, clubs and shops in Prague. Everything is within walking distance from there. Visitors can reach Wenceslas Square within 7-10 minutes on foot and continue down the river to explore more of Prague. If you go down Vinohradska street, you will reach the National Museum of Prague, or the Prague Orchestra within 7-10 minutes. A garage is now available for 400czk / 20USD / 15 EURO per day. Please let me know if you need a parking space as soon as possible especially during the high season. Visitors can reach Wenceslas Square within 7-10 minutes on foot and continue down the river to explore more of Prague. If you go down Vinohradska street, you will reach the National Museum of Prague, or the Prague Orchestra within 7-10 minutes. PICK UP ON REQUEST: I have my own driver, Mila, who is always happy to pick you up and drop you off at the Airport. The price from the airport to the apartment is 25USD and from the apartment to the airport 25USD (or 20 euro or 500CZK). Please note that the regular fee for Czechs is about 25USD. Unfortunately, all the taxi drivers rip off tourists, so I strongly discourage you from taking a regular (even an official) taxi from the airport, train station or in the streets of Prague. CAUTION: due to an increase of complains in Prague, I strongly discourage you from using taxies in Prague, unless you negotiate the price in advance. Please be advised that taxi rates within the center should not exceed 9USD. If you need a taxi, please text me and I will order it for you or call an UBER. CAUTION2: in Prague, there are many money exchange companies that rip tourists off. I suggest you either take money from ATM or use XCHANGE in Jindrisska street, Prague 1 (very close to Wenceslas` Square) or Alfa Prague at Palladium shopping mall at Republic Square. Excellent. Clean two bedroom unit with a lift. This property is nice and we would stay there again. It is located within a pretty neighborhood with nearby restaurants and within walking distance to the sights. The owners were available to answer questions and helpful. Overall it was an excellent rental. Gracious, spacious, beautifully appointed, clean appartment. This is one of the loveliest homes I have stayed in. The beds are comfortable, the rooms are spacious, and across the street is a beautiful park. The owners are very gracious and have created their own guide book to the neighborhood and Prague in general. The apartment was in good shape with all appliances in good working order. The rooms offer ample space, the WiFi is excellent high speed quality (> 100 mbit/s). The part of prague is just outside of the tourist swarm areas, quiet and safe. We have enjoyed our stay in this apartment and would choose it again if we came back to the city some other time. The apartment is extremely spacious and can easily fit 6 people or even 6 adults and 2 children sharing beds with their parents. It was very clean and newly renovated with all devices being available. It has got a vey big kitchen if that's of interest to guests. Around the corner is a very nice breakfast place which offers a good start into the day. Behind the apartment is the Riegrovy park with a beer garden and playgrond and a terrifoc view ove the city. The apartment is only a walking distance of 15min from the main train station which is a big plus. It's approx. 5-10min from the next metro station (namestin miru) where also the tram line 22 runs. This line passes many sights and goes directly to the cablecar and the castle on the Mala Strana side of the city. We met the host, Frantisek, a warm hearted and lovely person whi explained the surrounding and everything you need to know about the city and location. Sarah and Frantisek have written their own tour guide of recommended places to go - especially for famili with children. We can only recommend this apartment, its beautiful and the location can't be better! Thanks to Frantisek and Sarah, we will be back! All the best to you!